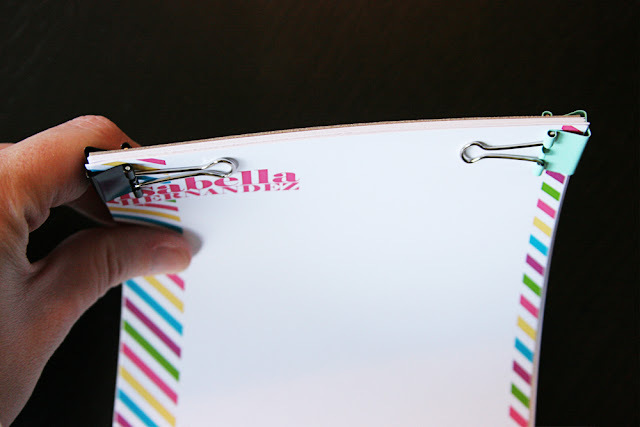 I decided to put together some personalized notepads for my kids/nieces/nephews for Christmas and thought I'd share an easy binding method in case you haven't seen it before. 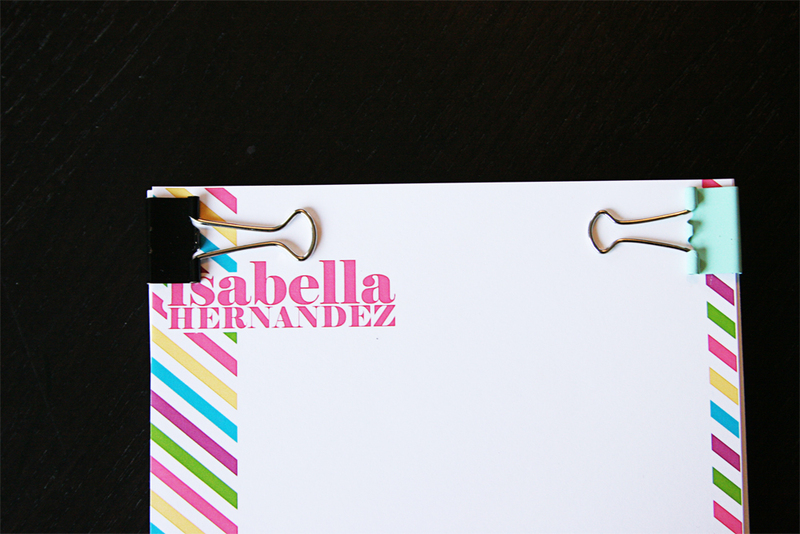 These would be great with some washi covered pencils...totally doing that. 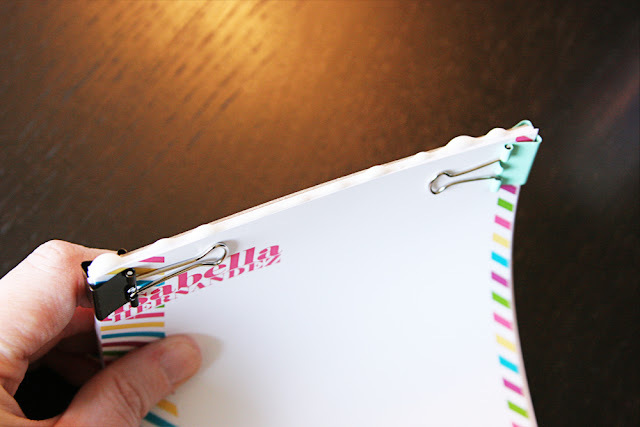 After cutting paper to size, add a chipboard backing (the backing from paper or even cereal of other food packaging works great,) align top edge and hold together with binder clips. Run a thin line of glue along the top edge - any white school glue works fine. I let the first coat dry and then add a second before removing the clips. This is very cute! Thanks for the giveaway! This is gorgeous, what a great idea! hanks for the opportunity to win. These are one of the sweetest.ideas! Thanks for the giveaway! What a cool idea!!! I think all kids like to see their name in print! I didn't know I could make a notepad with just plain old white glue! wow! that is so cool. thanks for sharing this awesome idea! Oh my! I would have LOVED to have a print shop in my family. I, too, have loved stationery and all it's accompaniments since I was a small child. I even still have some of my first monogrammed stationery, Crane thank you cards from my birth! What kid (big or small) wouldn't love this?!? cute, cute, cute! oh my gosh, I HAVE to do this for my girl. She would freak out opening up a personalized note pad! You're the best. You rock! I never knew it was that easy! 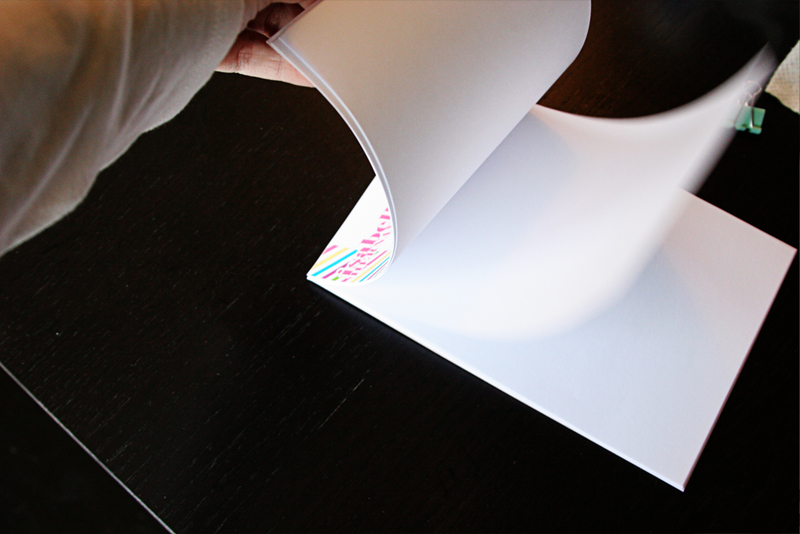 I totally want to make a notepad now. Such a great idea !! Love it, thanks for the chance Erica. So much fun! Thanks for the giveaway! Great idea! Thanks for the chance! Love this idea especially it's personalised! Thanks for the idea! What a great idea! These look wonderful. Would love to win - thanks for the opportunity! I absolutely love the idea with a personalized gift, and I´m sure everyone would love to recieve a gift like this too. Thanks sooo much for sharing the great ideas here. 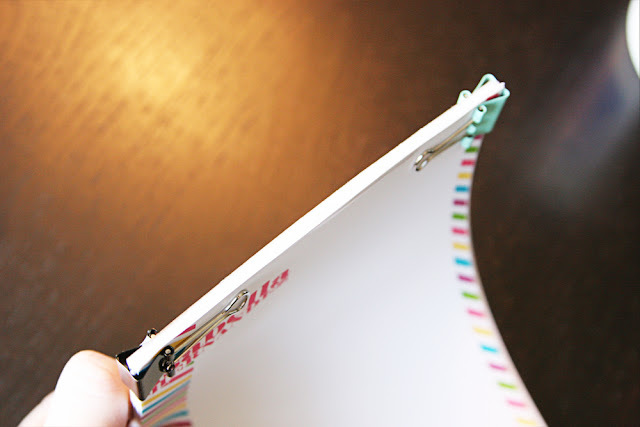 Can't believe it so easy to bind these, I'd heard that you can get the proper glue so I'd always dismissed the idea.. wow! A blank notebook has always been one of my favorite things. I, too, thought there were special binding products. Thank you. Super fabulous idea!! WHO KNEW!?!? Thanks for sharing!! Super idea for kids and adults too - thanks so much! Love it. I am going to subscribe by google reader. I hope it's OK.
You've solved my search for 'last minute' gifts; this is PERFECT!! Thank you for sharing this and for offering a free download opportunity. Most inspiring! Yes,I love this idea. Technique I can use with a calendar project. Thanks. I LOVE this idea! I have been in a mad frenzy trying to figure out something special to make my daugthers teachers....I think this will do the trick! What a fabulous idea...love it!! What a great idea! The perfect little gift or stocking stuffer! Thanks so much. I can think of several people to make this for. I loved personalized stationary when I was a kid too (and still do). Great gift idea!! This is a great idea. When my daughter was in kindergarden as a gift one of the mom's made personal stationary for all the children. I thought it was genius. Thanks for sharing. What a wonderful idea and thank you so much for sharing how to do it. I love note pads, and to think I could make my own is just awesome. What a clever ida and great for gifts year round! Thanks for the idea. Happy Holidays! This is a great gift idea. Tfs. You are a GEEEENYUS! I whipped up a couple of little notepads for a girlfriend's birthday today, and they're darling! Thanks for the tutorial, E! Great idea!!! More projects for make before Monday. Will have to thing of an easy way to personalize each tablet. ANOTHER great idea!! Thanks for sharing......great gift & simple too! Great idea. Great stocking stuffer! What a great idea and very fun giveaway!!! Very cool idea! I'd love to see some of your Dad's work. Thanks for sharing this! Would love to win - thanks for the opportunity! Fabulous! Being a teacher, I know how useful this would be for my daughter's teachers. I'm so going to do ths. Thanks. What a great idea, and would be a nice gift for a lot of different people, teachers, co-workers, and neighbors to mention a few and holidays. Even for people who just like to doodle, especially small children to keep them busy while running errands. Wow this is such a great idea. My niece is getting a desk for Christmas and I have been getting all kinds if things This would be an awesome addition. as a teacher I know I'd make them for colleagues too, how fun. Would love to get this give-away! Thanks so much! I always thought you needed special glue to make these pads. You've empowered me to try making some of my own. Thanks for the great idea and sharing it. This is a wonderful idea - and you make it so easy. Thanks for sharing and the chance to win. What a great gift idea! Thank you for sharing. So glad to find your blog and see this idea! It is a great gift for that hard-to-buy-for person. This is such a neat idea. TFS. 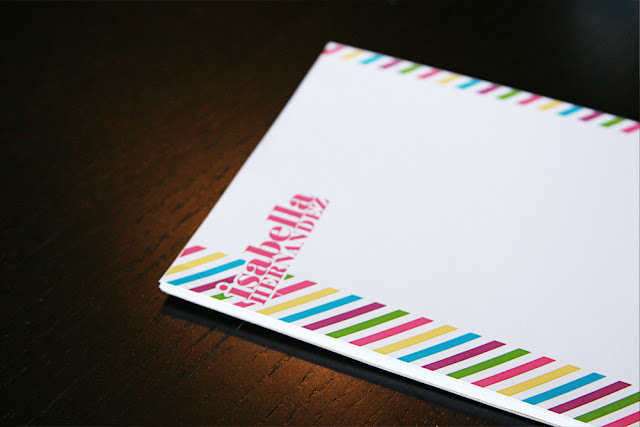 Hi Erica, I got here from Ms. Jennifer's blog (of course)and I came because I just love the idea of actually making a personalized notepad! What an awesome stocking stuffer... Thanks for sharing this new-to-me idea!!! Got here through Jennifer McGuire's blog. This is a great idea! I just made some last minute gifts last night. So easy! I recycled office paper that we would have just thrown out anyway, and used cut up cereal and cracker boxes as the cardboard. Thank you! This is so cool. I'm so glad that I happened upon your blog today....now let's see if I end up making some of these for the holidays. Awesome idea! I think it's cool that you show how to make a notepad with regular glue - I've run into a couple other tutorials in the past but they always required buying some specific kind of glue for this, which nobody would have just lying around like they might with regular glue. Thanks for the tip!